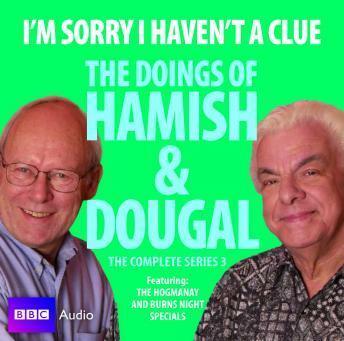 Barry Cryer and Graeme Garden star as Hamish and Dougal, with Alison Steadman as Mrs Naughtie, and Jeremy Hardy as the local Laird. Gambling Fever sees Hamish becoming addicted to gambling after winning a Sporran Cosy in the Glen MacLottery, while in There's Something About Mrs Naughtie, the lady comes into an inheritance and attracts the advances of Hamish, Dougal and the Laird. In The Subsidence Adventure, Hamish and Dougal advertise as 'builders to the gentry', while in Inverurie Jones and the Thimble of Doom, a treasure hunter plunders the local museum. Look Who's Stalking finds Hamish and Dougal employed as ghillies to the Laird's stalking party, and Porridge Votes sees the Laird standing in the local by-election - with Hamish and Dougal running against him. Also included are two festive episodes, Burns Night and the Hogmanay Special in which the duo are joined by Clue stalwarts Colin Sell and Tim Brooke-Taylor, and Humphrey Lyttelton makes a guest appearance as the Laird's butler.